The Air Jordan 2010 is an innovative basketball shoe built for speed, as today’s basketball player needs to be able to react quickly in any situation. An independent toe cap has been utilized, the first for a Jordan Brand shoe. The independent toe cap offers increased maneuverability for the wearer without compromising the fit along the eye-stay. Although the overall design looks bulky, the large Phylon midsole cups the foot while still maintaining a low profile feel for enhanced court feel. It has been built with thinner cushioning and less layers, placing the foot closer to the ground and thus creating more responsiveness. The Air Jordan 2010 features a TPU window, or “peep hole,” another first for the Air Jordan line. Also featured is a thinner out sole, adding to the low profile, providing extra responsiveness while ensuring great traction with the implementation of its full length Herringbone pattern. Cushioning comes in the form of Nike’s beloved Zoom Air. Placed under the Phylon midsole, directly above the outsole, a full length Zoom Air unit can be found which absorbs impact and returns energy directly upon foot-strike movements. Inside, a heel and forefoot Zoom Air unit has been top loaded for additional comfort. An Ortholite insole makes its debut on an Air Jordan model offering additional comfort along with its moisture management & anti-microbial properties. Leather makes up the upper on most models, with some featuring patent leather or nubuck. Side panels have been perforated for additional ventilation along with the TPU window while mesh makes in way onto the tongue and under the independent toe cap. An asymmetrical ankle collar is in place, conforming to the lateral side under the ankle while the medial side is cut higher for additional support. Padded heel notches are in place to ensure heel slip in a non-issue when performing. 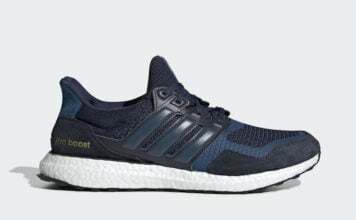 Four additional TPU frames have been strategically placed at the heel, acting like a heel counter, as well as the medial and lateral side of the forefoot as the independent toe needs additional support for hard cuts and slashes to the rim. A hidden message can be found on the box sleeve, inner lining and midsole which reads “I’ve failed over and over and over again in my life; and that is why I succeed”. 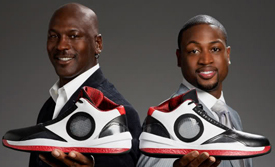 Along with the regular Air Jordan 2010, there were an outdoor and Team version released as well. 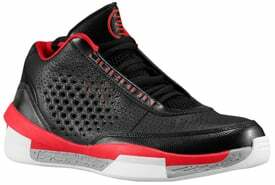 The Jordan 2010 Outdoor featured bottom loaded Zoom Air, top loaded heel Air Max and top loaded forefoot Zoom Air. The TPU window had been replaced by large perforations while leathers had been replaced by sturdy synthetics for increased durability. Cross straps were a prominent feature offering the wearer an unmatched lockdown fit. The Jordan 2010 Team featured the same as the 2010 Outdoor sans cross straps and independent toe cap. While the design was hard to get used to, the overall performance made up for any aesthetic uncertainty.